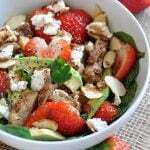 A creamy, crunchy, and delicious chik’n salad that will blow your mind! Oh yeah, this just happened, and I ate the entire bowl of it after I finished photographing it. No shame. You guys, I’m nothing if not honest, and I have to say that I’ve been missing the taste of a good chicken salad. I haven’t been missing chicken, heck no, but the creaminess and the crunchiness of a good chicken salad with pieces of red grapes, dried cranberries, and celery, and green onions, that, I’ve been missing. If you’ve been feeling the same way, you’re going to love me for making this. So a woman (me) walks into a supermarket, grabs a ticket at the deli counter, and looks over all of the salads in the case while she patiently waits for her number to be called. There’s a broccoli salad, bean salad (what I ordered), multiple pasta salads, and a creamy classic chicken salad. A dribble of drool dripped from the side of her mouth (not really) when she looked at it. It wasn’t the chicken that caused that embarrassing reaction, heck no, it was all of the other ingredients mixed with the creamy mayo that made that salad look so yum. Driving home I kept thinking about how I could replicate that salad and make it vegan, and then it dawned on me, jackfruit. The obvious choice when you want to make a meaty vegan dish. 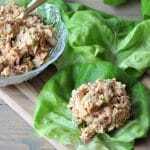 And, I discovered a trick when I was creating recipes for our cookbook that I used in this recipe to make the jackfruit taste like the chicken salad that I used to eat weekly when I was a kid. 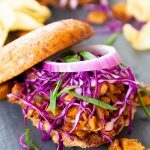 The secret to making jackfruit taste like chicken for this classic vegan no-chicken salad is to simmer the jackfruit in no-chicken broth for about an hour. It absorbs the flavor of the broth and adds a great flavor. 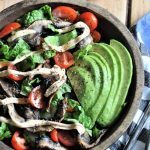 It’s so easy to make this vegan version of chicken salad, the only thing that takes time is soaking the cashews and simmering the jackfruit in the broth, but that doesn’t require any effort on your part, so let’s not even worry about that. Simmer the jackfruit in no-chicken broth, I use this. After it’s done simmering, drain the liquid and put the jackfruit in a bowl. Make the vegan mayonnaise in your blender. Put the vegan mayonnaise, jackfruit, and the rest of the ingredients in a large bowl and stir to combine. Chill it, or don’t, it’s up to you. You can eat it on toast for a satisfying sandwich, or you could stuff in in an avocado or tomato for an elegant salad. Or, you could just eat it straight up. Make this and come back and let me know how you liked it. I love to hear from you. 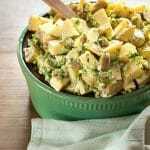 A creamy and healthy vegan version of chicken salad. Bring the broth to a boil and reduce to simmer. Drain and rinse the jackfruit and add to the broth. Simmer for 1 hour. Drain the broth and shred the jackfruit. 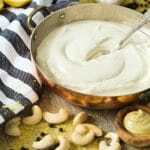 Drain and rinse the cashews and put in a high-powered blender with the almond milk, lemon juice, garlic, and salt and blend until smooth and creamy, approximately 90 seconds. You shouldn’t see or taste any pieces of the nuts. Put the jackfruit, cashew cream (add slowly until you get the desired amount of creaminess), celery, green onion, grapes, cherries, thyme, and salt and pepper in a large bowl and stir until combined. Chill or eat at room temperature. Refrigerate in an air tight container for up to 2 days. This looks great! I haven't tried cooking with jackfruit before but have had smoked "pulled" jackfruit and really enjoyed the texture. I'll have to venture out to trying it at home now! Thanks, Katie! I love pulled jackfruit too. Whole Foods makes an excellent vegan chicken salad; it's not nearly as healthy as yours but good in a pinch! I love your recipe for times when I want a whole, healthy batch and don't want to pay $$$ for it! Yum, this looks wonderful and love the use of jackfruit and cherries. Thanks! Thank you! They're so good in salads.